Korean BBQ tacos have been a street food phenomenon since LA’s Kogi BBQ trucks started drawing hundreds of hungry Angelenos to street corners around Southern California. Kogi’s popularity spawned a blatant knock-off, inspired others to start their own mobile food ventures, and compelled other Korean establishments to add Korean tacos to their menus, such as SF’s Seoul on Wheels, Namu, and John’s Snack and Deli, and NY’s Seoul Station). For food bloggers, creating our own version of the dish we don’t have easy access to becomes a fun little project. Seoul on Wheels’ Korean tacos at Oakland’s Eat Real Fest 2009. I set out trying to emulate the famous Kogi taco, and this led me in several directions. 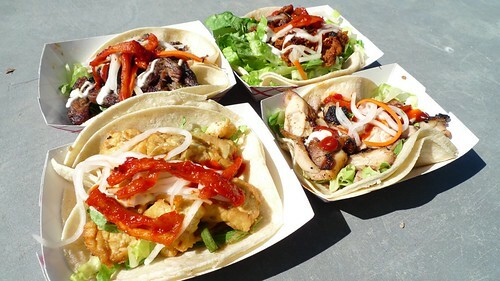 I focused specifically on kalbi tacos since I’ve always been a big fan of grilled Korean short ribs. In the past, I’ve relied on jarred marinades, but this time I wanted to make one from scratch. I put out a call for recipes on both Twitter and Facebook, and my friend Kevyn came through with an excellent kalbi marinade. 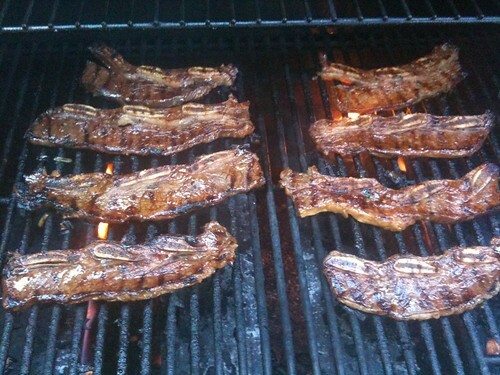 Feel free to use your favorite kalbi recipe if you have one. The question of corn v. flour tortillas doesn’t exist here because tacos should ALWAYS be on corn tortillas, but tortilla size is an important issue. I used 4-inch tortillas because it makes the tacos easy to pick up and eat one handed. However, the smallest tortilla that is carried by most mainstream American supermarkets is 6 inches in diameter, which I generally find too big and unwieldy for taqueria-style or street tacos. If you have Mexican market nearby, 4-inch tortillas shouldn’t be hard to find. Figuring out the rest of the taco required a lot more research. 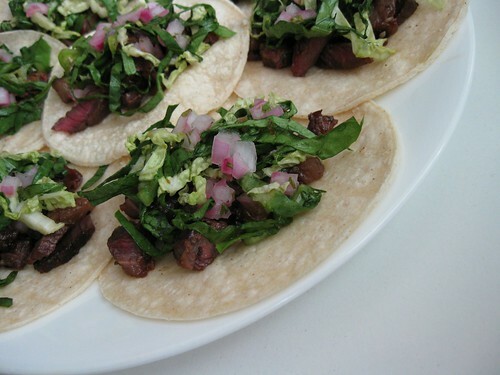 I started at SteamyKitchen.com and Jaden’s recipe for Korean-style Kogi Tacos, which includes a BBQ sauce recipe developed for her by Kogi Chef Roy Choi. The Kogi BBQ sauce is intended to go with pork or chicken, but I think it works really well to balance out the rest of flavors in the taco. Tasty Eats at Home did her own version of Korean tacos, and I used her cilantro-red onion relish for this recipe. I like the color and flavor that the red onion provides over brown or yellow onions. The last major topping is napa cabbage/romaine slaw dressed with a chili-soy vinaigrette that I lifted from the New York Times. I ended up making the tacos based on the recipe that follows three times, and by the third time, we pretty much had all the logistics down. 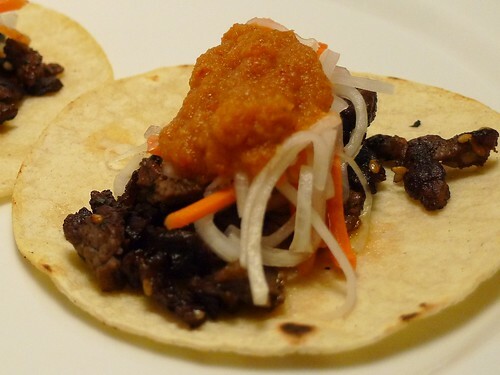 I also made some other Korean taco variations a few days ago, and you can see those at the end of the post. Combine all ingredients except meat in a bowl and mix well. In a one gallon ZipLoc bag, combine meat and marinade. Let sit for 24-36 hours, flipping over the bag every 12 hours or so to ensure the marinade is distributed evenly. Whisk together all the ingredients. If desired, add Sriracha a few drops at a time to the sauce until it’s hot enough for ya. :) If you have one, put sauce in a squeeze bottle to make taco assembly more efficient. Add onions and rice wine vinegar in a bowl. Allow to sit for about 5-10 minutes. Drain and rinse. Add rest of ingredients to onions and stir to combine. Whisk together the soy, vinegar, garlic, jalapenos and ginger and set aside. Combine Napa and Romaine in a bowl until mixed well. You should have a nice green/white color contrast. For best results, divide slaw into batches and dress each batch as needed so that the greens don’t get soggy. Grill short ribs about a minute per side on a really hot grill. Separate the kalbi meat from the bones and gristle. 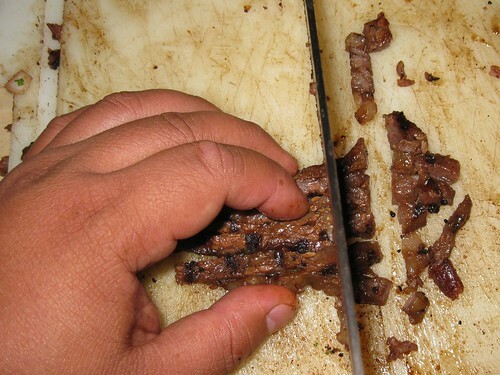 Cut the meat it into strips lengthwise, then turn 90-degrees and dicing the meat into a “brunoise” of kalbi, if you will. :) If you like the gristle, I’d separate that from the bones and dice it up too. Set the meat aside in a bowl until there’s enough meat to start making tacos en masse. OPTION: After all the meat is diced up, you can either use it straight away or refry it to caramelize the meat so that each piece has a little crunch to it. This extra step is also good if you’re going to use the gristle since it lets it break down a lot more. I’ve done it both ways, and the extra caramelization is really nice. Heat a lightly oiled cast iron skillet over medium heat. Toast tortillas 30-45 seconds on each side and set aside. Working with a partner or two in an assembly line works great here so tacos can be made right after toasting. 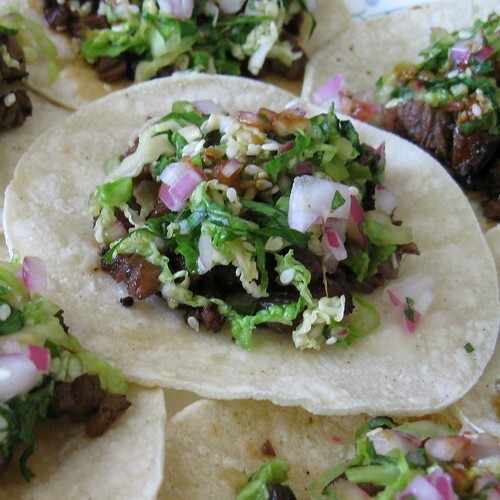 Start assembling the tacos by putting a little meat in the tortilla, then top with a bit of the cilantro-red onion relish, a little slaw, a little more cilantro-onion relish, and then drizzle a little BBQ sauce to finish. We eyeballed all of these amounts, but don’t overstuff the taco or else it will too hard to pick up and eat. You can arrange about eight tacos per plate. Replace the cilantro-onion relish with a pickled radish/carrot salad (known colloquially as “mu,” if anyone knows what this is actually called in Korean, I’d love to know.) This was my second-favorite version of the taco that we made. To go even more Korean, I stole an idea from my friend Euge and blended up a jar of kimchi to make a Korean salsa that replaced the Kogi BBQ sauce. I’m not a big kimchi eater, but I liked this a lot. If you like kimchi, this is a great alternative. 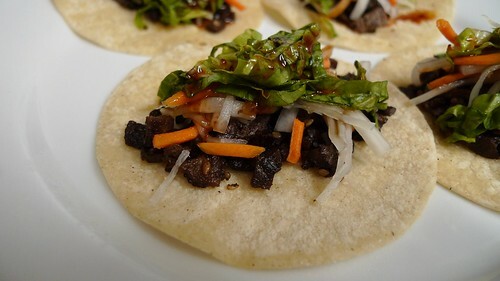 I’m not sure how many tacos this actually makes because we’ve never had to use all the meat for tacos, and it’s never a bad thing to have extra kalbi around. :) I do know that you can get at least 40 tacos out of 4-5 pounds of meat. You can easily scale this recipe down for your own needs, but I was cooking for parties and needed a lot of food. These look so good! Definitely going to give these a try. These look so yummy! Thanks for using my relish – this reminds me, I need to make these again! Now that’s collaboration! Love it! we’ve had kogi, and honestly wasn’t all that. Your’s look great however and love the use kimchi spread. the chili paste spread, Kochujang would also be good too. Will have to try this at home! Alice, hopelessfoodie, and Theda: I hope you find time to make them. It looks like a lot of work, but if you’re cooking for a small group, it’s a lot easier. Looks delicious! I agree with your comment regarding flour vs. corn tortillas, however I do now prefer fish tacos on flour tortillas for some reason. people who use flour torilla for street tacos should be shot. I stumbled on your blog post when I was looking for ideas for dinner the other night. Since it was a quick dinner night, I just used the marinade recipe and the cilantro-onion relish and it was great! Looks delicious, I’ll have to make it soon! About the radish and carrot salad, the word for radish is “mu” and salad is “mu-chim”. Mu mu-chim is a very common side dish in Korea, and one of my favorites. blog and wanted to say that I have truly enjoyed surfing around your blog posts.